ThroughPlay is a parent-education research program sponsored by the University of Utah and the Sorenson Legacy Foundation and designed to explore the role of play in healthy child and adult development. The concept of “me time” might seem inherently selfish. If we want the best for our children, we should be selfless, right? Well, not entirely. Our research suggests that parents who have had frequent play experiences in their life are more likely to fully support parent-child play and to encourage their children’s own unique sense of play. Many balk at the use of the word play with adults; it somehow sounds too “childish.” That’s why the experience of play in adulthood is often described as “flow,” which is strongly related to positive adult development. We give kids permission to play, which allows them to feel unselfconscious and relaxed when they do. But unless we give ourselves permission, no one else will, and we can end up feeling guilty about taking the time to do it. 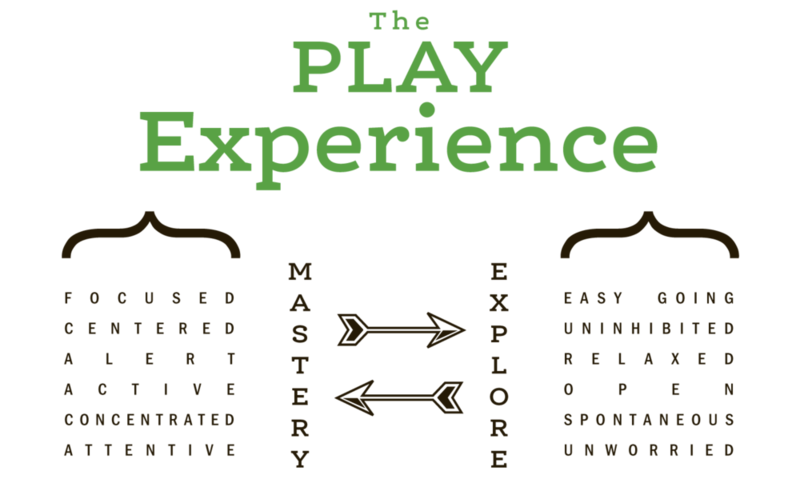 Through play our state of mind is easy going and spontaneous, worry-free and uninhibited, relaxed and open; so it is easier to discover and embrace new information and challenges. Our guard is down, we are not concerned about making mistakes, and we stand ready to explore the world and try something new. On the other hand, through play we are also focused and centered, active and alert, concentrated and paying close attention; this disposition creates a readiness and ability to master any challenges we risk letting in. It helps restore a sense of balance that allows us to stay engaged with the activity we are doing. If the balance between exploration and mastery is lost, play stops and learning slows. Of course, context is critical as well. In the wrong setting, it’s impossible to relax or focus. As adults, we decide when, where and how we play best. Children typically need more support—something Maria Montessori understood when she established her educational method. She believed children thrive in prepared environments where they’re encouraged to act freely. Freedom within limits fosters “enjoyable concentration,” or what we call a state of play. Montessori teachers encourage this state by setting up so-called prepared environments—safe, orderly and beautiful spaces with materials that reflect children’s interests and grab their deep attention. When we enter adulthood, it’s easy for play to take a back seat. And it’s not just parents who tend to abandon direct flow experiences as they mature. Once we’re past adolescence, most of us take on increasingly serious and sometimes overwhelming responsibilities that conflict with past-times we previously prized above all else. Who has time for “play” when you’re working 40-plus hours a week, going to school, trying to stay healthy, trying to meet a romantic partner or maintain a relationship? What about friends and family? Where does play fit in? Add parenting to the mix and the idea of play seems foolish, if not impossible. But even parents of very young children can find enormous benefits for themselves and for their children by making room in their weekly schedule for a small window of direct flow. Even a half hour or hour each week goes a long way to reconnecting with your sense of self. The focused-yet-flexible state of play is ideal for discovering your passions and for finding ways to engage those activities in your daily life. For example, one person’s play activity might be cooking. Play is not only a great way for them to learn more about the kinds of cuisine they like; it is also an ideal way to share their interest in cooking by preparing a meal for family and friends, taking a class, or having a conversation with someone who also loves to cook. Maintaining play in your life is an essential mode of making connections and staying on a path of lifelong learning. So what’s the secret to reconnecting with flow experiences? First, give yourself permission to play. Seriously. And don’t feel guilty about it. Second, create your own prepared environment. Just as children’s free play depends on the right blend of context, structure and freedom, adults need the same limits to unleash their imagination. We have to set the right tone in the right setting, buy any materials we might need, and give ourselves an enjoyable goal or challenge. Need additional support? Enlist friends and mentors to help you kick it into gear. Oh, and don’t worry about your skill level. We would never stop children from playing because they weren’t good at something. Expertise isn’t requisite to enter a state of play.